Blocks from my quilting bee last year (one block over). I told you I'm really into houses right now. Inspired by this quilt. I'm still missing a few blocks, but I think I'm going to make it 4 blocks by 5 blocks. So, I still have some houses to make. I have debated putting some sashing in. I LOVE every block, and can't wait to see it come together. i ADORE this! i'm inspired to do houses now too! These house blocks are just so cute! They're going to make a great quilt! I have always loved house blocks! This is really , and truly beautiful. I love the blocks and looking at the center piece is fun! Can't wait to see what you decide...sashing or not. It's so bright and fun! How CUTE! I love it!! I would add a thin strip to seperate the houses to make it look like a little community of them! How pretty! This is going to be a great quilt. Her choice of putting white sashing made the picture-blocks look like framed art. Check it out! The little houses are so cute. Will make a delightful quilt. Such a cute quilt! What a great way to use up special little scraps! Oh this will be cool. I love it and the inspiration quilt. Thanks for sharing! Love it! You do realize that one of the houses is horizontal rather than vertical right? You may have done it on purpose (which I'm not opposed to at all!)! The houses are wonderful. I love them all and can't wait to see what you decide to do and how it turns out! what fantastic colors - and the house-blocks are just GREAT!! Please post an "after" picture too. I think that some Sashing would be an excellent idea. Each block needs to be seen! 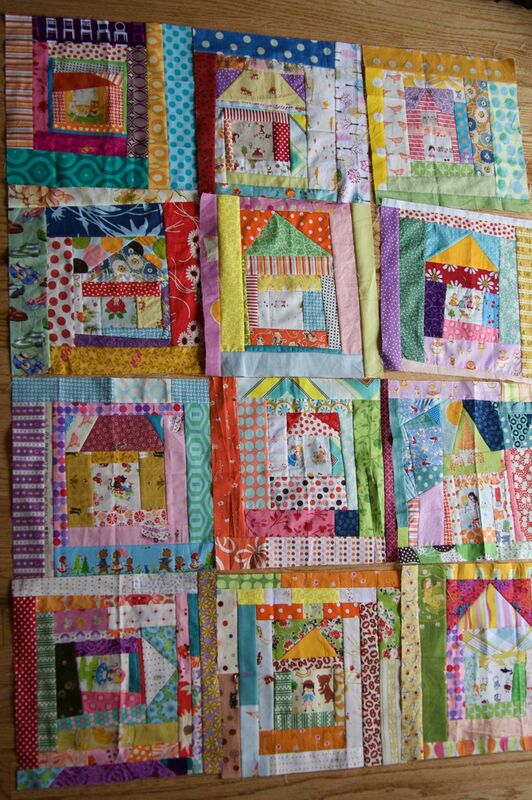 I am inspired by your blocks and am making a similar quilt to donate to the hospital ministry at my church.It's a great way to use up scraps. I love this quilt. When you have a minute (I know you are a super busy mom like me) can you show how to make the blocks? I know how to do everything but the triangle at the top for the roof. You create beautifully! Sooo cute! I just might have to make one of these! Love string quilts. The houses add that little something special to the whole thing. I think that they look soooo spectacular! Who knew houses could be so modern and cute! Love these little houses! I've been thinking of spending a day cleaning out the scrap bins - this might be a good inspiration! I love the idea of not mitering corners! And the houses have little people in them!!! Love it. 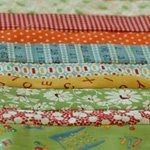 What adorable blocks, you are going to have a super cute quilt. Too fun. I wonder if I have enough time in my workday to read the entire contents of your blog. I hope I do. It is wonderful.